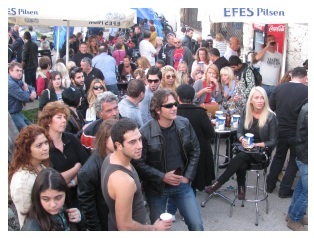 e first Ozanköy Motorbike Festival to be held in the village. 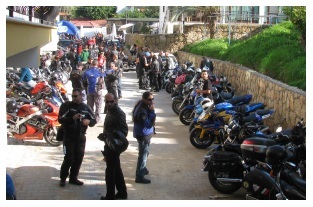 This event was supported by the Bikers Club Cyprus and GAU Motorbike Club with the aim to create awareness for motorbikers and cyclists of road safety, the need to wear helmets and to drive safely and sensibly. For this reason there have been motorbike festivals in other villages to get the message across. There were a fair few gleaming Harley Davidson bikes as well as Suzuki, Honda, Ducati and many other leading makes, I have never seen so many together in one area and thought it was a lovely sight. One in particular caught my eye which had a seat like an armchair, a huge bike which looked as though it had everything but the kitchen sink! House Restaurant acting as hosts and there we saw Steve and Rowena Skinner of Café Boss busily preparing snacks on the terrace for the people who had made their way to the village to see this spectacular event. As well as the local Cypriot community there were many English and other expatriate residents present. This was a coming together of different nationalities and age groups which is such a good thing for North Cyprus showing the spirit of togetherness and friendship here. 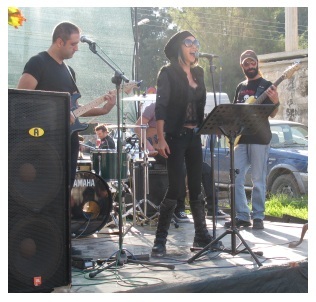 spoke to Erin Elizel, who is the singer with the group, and she told me that they appear at the Corner House on Tuesdays and Thursdays as well as performing at other venues around the island and the name of the group depends on where they are playing. The group have been together for 10 years and their performance was brilliant, they were really belting out the songs much to the enjoyment of the crowds. 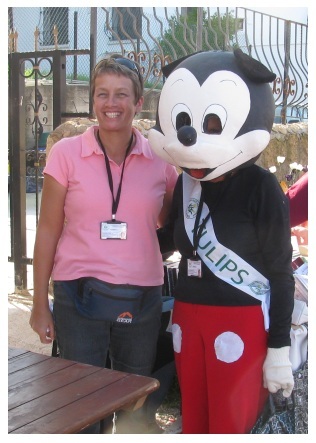 Sue Tilt was there with tickets for the Golden Heart Raffle in aid of Tulips, there are some lovely prizes on offer and Sue said she was doing really well with many people buying tickets, not so much for the prizes, they were only too pleased to help. Carole King appeared, disguised as Mickey Mouse, it was quite a sunny afternoon so I would think she was getting rather warm inside that costume. We spoke briefly with Jawa Ali (Ali Yuksek) who said he was very pleased with the way the afternoon had gone and the importance of road safety for motorbikes and bicycles. distance as we walked back to where we had parked, we had time to reflect on the amount of activities there are in and around the area for people to enjoy. Thanks are extended to Mark Rumbelow for allowing us to reproduce some of his photographs along with ours. With apologies to Mark that we have been unable to upload you video recorded ant this event into this article and not wishing to disappoint our readers we have included a link to a musical video “Devils Lullaby” a tribute to Bikers everwhere. click here. It all looks very good and cheerful and I like the picture at the top of the article.